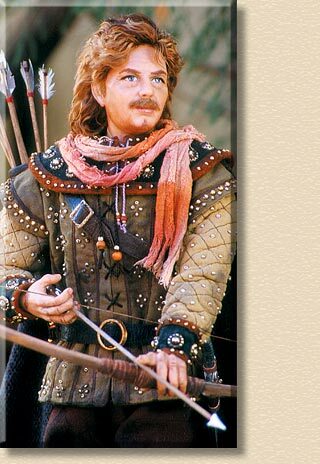 The legendary 13th century outlaw who lived in Sherwood Forest, and stole from the rich and gave to the poor. Media: Head, hands and feet of Super Sculpey, on a wire armature, with a cloth body. Dark blonde mohair moustache and hair. He wears brown pants, dirty leather boots cross-laced with brown leather strips. His sleeves are light olive fabric, quilted and beaded. His tunic is a dark olive, quilted and beaded to represent tiny studs. He has leather wrist-guards and collar with metal studs and beaded edges. He has a long dark green cloak, and an orange fringed scarf around his neck. Props: There's a leather quiver full of handmade arrows on his back, and he holds a handmade bow and arrow.